Andrew Carnegie was a Scottish-American industrialist, businessman, entrepreneur and major philanthropist. One of the most famous leaders of industry of the late 19th and early 20th centuries, he is often regarded as the second-richest man in history after John D. Rockefeller. His life has often been referred to as a true "rags to riches" story. 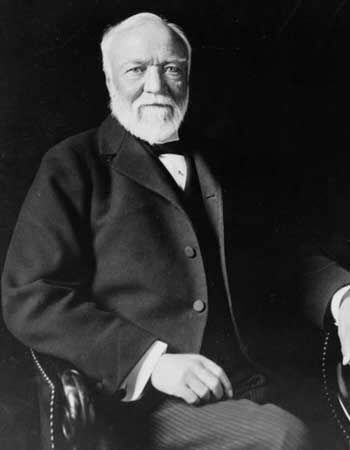 Carnegie immigrated to the United States as a child with his parents. His first job in the United States was as a factory worker in a bobbin factory. Later he became a bill logger for the owner of the company, and soon after a messenger boy. Eventually he progressed up the ranks of a telegraph company, and by the 1860s he had investments in railroads, railroad sleeping cars, bridges and oil derricks. He built further wealth as a bond salesman raising money for American enterprise in Europe. In the 1870s, he founded the Carnegie Steel Company, a step which cemented his name as one of the �Captains of Industry.� By the 1890s, the company was the largest and most profitable industrial enterprise in the world. Carnegie sold it to J.P. Morgan in 1901, who created U.S. Steel. With the fortune he made from business, he later turned to philanthropy and interests in education, founding the Carnegie Corporation of New York, Carnegie Endowment for International Peace, Carnegie Mellon University and the Carnegie Museums of Pittsburgh. Carnegie gave away most of his money to establish many libraries, schools, and universities in America, the United Kingdom and other countries, as well as a pension fund for former employees.